A construction worker attaches a board to a new office for the grain elevator in Greensburg, Kansas. The tornado that hit Greensburg on May 4 took its time, rolling up Main Street like it was on a Sunday walk to church. Ron Shank, the owner of the Kansas town's only General Motors dealership, hid with his wife beneath a quilt in the basement, but they heard the storm rip their home from its foundations. Marvin George, a pastor at the Baptist church, sheltered in his closet. "We just knelt and prayed," he says. "I wasn't scared until the next morning, when I saw the carnage." The tornado had measured EF5 on the Enhanced Fujita scale, the highest possible rating, and it left hardly a single wall standing. "I could only think of Hiroshima," remembers Lonnie McCollum, then the town's mayor. "Big strong men looked at what was left and were damn near in tears." Over 1,000 people  more than two-thirds of the town's population  were left homeless. Despite the help that poured in over the following weeks from FEMA, from charities and from nearby towns, residents feared their town had suffered a deathblow. Like many rural Midwestern towns, Greensburg had been losing population for years. Jobs had grown scarce, and few in the town's shrinking high school classes stayed on after graduation. Why rebuild a dying town? "We were barely making it before the tornado," says Wylan Fleener, whose century-old furniture store was reduced to a pile of bricks by the storm. "I thought about leaving every day." 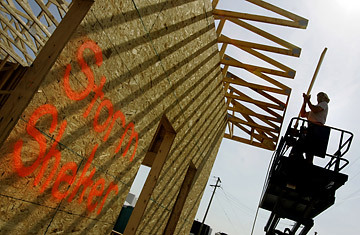 Others saw in the devastation a blank slate on which Greensburg could build back better, by building back greener  energy-efficient homes and offices, powered by Kansas's abundant wind and biofuel resources. The heartland community could become a mecca for environmentalists, including green businesses that would bring jobs. "This is an amazing opportunity," says Daniel Wallach, an entrepreneur from a nearby town who formed the non-profit Greensburg GreenTown. "It could be a living laboratory to demonstrate to the rest of the country and the world what a town of the future could look like." Greensburg residents were understandably skeptical. Many were still living in the clusters of trailers nicknamed "FEMAvilles," and they were more concerned with getting any kind of roof over their heads than with the quality of its insulation. Federal and state governments would only pay them 85% of the value of a destroyed house, and after all, wasn't "green" for those who could afford it? "There was resistance to change," says Gene West, the county commissioner. "This is a rural area, and a conservative one." But as Wallach and his allies began to shift local opinion by showing that going green wasn't just about climate change or saving the polar bears, it was about cutting waste and saving on rising fuel bills, building a stronger and more resilient town with a sustainable economy. Those arguments made sense even in one of the reddest states of the U.S. "Our old church sometimes cost up to $1,000 a month to heat," says George, who plans to build back his church to the highest green standards. "Now, I'm not a tree-hugger by any means. But we have to be responsible for how we use natural resources, and be prepared for a future where energy costs are only going up." Today Greensburg is living up to its name. Consultants from the Department of Energy and the National Renewable energy Laboratory are helping residents build new houses that are up to 50% more energy efficient than their old homes. The Discovery Channel has spent months documenting the town's reconstruction for a miniseries on the Greensburg experience that will be produced by Leonardo DiCaprio. In early January, the city council approved a plan that would make all public buildings in Greensburg conform to the Platinum rating of the U.S. Green Building Council's Leadership in Energy and Design (LEED) standards  something no town in the America has ever tried. Ron Shank's car dealership, which had been close to closing, will be rebuilt as a model green facility for GM, and Google is even thinking of opening a wind-powered data center nearby. "I think it's going to be a permanent draw," says John Janssen, the town's current mayor. "We're going to be one of the greenest towns in the world. Except, maybe somewhere in Europe." The green revolution may not make Greensburg a tourist mecca, but it has become a working model for other towns. "If Greensburg can do it, then green is definitely mainstream," says city administrator Steve Hewitt. "The heart of America now gets it." Still, green or not, for some Greensburg will never heal. Former mayor Lonnie McCollum, one of the first to raise the idea of building green, quit his post three weeks after the tornado, citing exhaustion, and eventually moved with his wife to the neighboring town of Pratt. On recent Friday, McCollum spoke wistfully of the town in which he had lived his entire life. He can't let Greensburg go, but he can't return, either. "We had a Norman Rockwell existence," the 62-year-old says. "For me, it's completely gone. There's nothing out there for me but heartache."